A 21st century worshipping church, which is God-centred, Bible-based and purpose-driven. A loving church, spiritually deep and yet full of fun, heavenly minded and yet doing earthly good, relevant and yet prophetic. A church passionately in love with God, where every member longs to bring His love to a lost and hurting world. A church with a clear sense of identity, authority and purpose in Christ, where every member is confident, victorious and overcoming. A loving, caring church, where the oppressed and broken hearted find new hope, healing and a sense of belonging. A church of ordinary people living extraordinary lives, being trained, equipped and released into ministry. A church impacting the villages and the nations, demonstrating kingdom values, doing works of service and moving in the supernatural power of God. Would you like to join us on this journey? 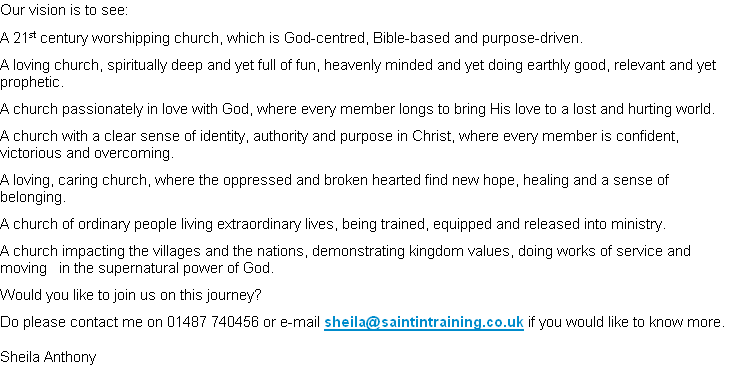 Do please contact me on 01487 740456 or e-mail sheila@saintintraining.co.uk if you would like to know more.